Circle. Total available vacancies in Rajasthan Postal Circle Recruitment are 33 posts. Candidates who are residents of India fulfilling eligibility criteria are advised to access the official website @ www.doprajrecruitment.in. Upload the application forms through online from 15/November/2017 to 14/12/2017. Candidate must have qualified Matriculation or ITI are eligible to apply for MTS Jobs. Age of the candidate must be between 18 years to 25 years as on 14-12-2017. Application processing fee for UR/ OBC candidates is Rs. 100/- and Examination fee is Rs. 400/-. Candidates belonging to SC/ ST/ PH/ Woman category need to pay only Application fee of Rs. 100/-. 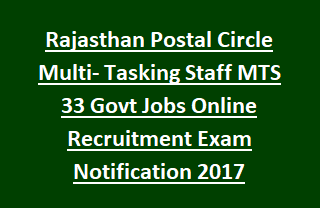 Selection of candidates for Multi Tasking Staff Jobs in Rajasthan Postal Circle Recruitment is based on their merit in Aptitude Test. Full details regarding Examination Procedure, Syllabus & pattern of Aptitude Test, Application procedure, Application fee, Age limit, Examination Centre for Rajasthan postal Circle Multi- Tasking Staff MTS Jobs Recruitment are stated below. Available vacancies in Rajasthan Postal Circle Recruitment are 33 posts. Post Name: Multi- Tasking Staff (MTS): 33 posts. Candidate must have passed Matriculation or ITI from recognized Board or University. Pay Scale for MTS Jobs is Rs. 18,000/- in Level I plus allowances. Minimum age is 18 years and maximum age limit is 25 years as on 14-12-2017. Age relaxations permissible as per Govt instructions. Candidates will be selected for Multi- Tasking Staff vacancies will be based on their merit in Aptitude Test (Objective type). Aptitude Test comprising 4 parts- Part A, Part B, Part C (i), Part (ii). Total marks are 100 and the time duration is 2hrs. -Part A: General Knowledge- 25 marks-25 questions. -Part B: Mathematics- 25 marks-25 questions. -Part C (i): English Language: 25 marks-25 questions. -Part C (ii): Regional Language: 25 marks-25 questions. UR: 10 marks in each part and 40 marks in aggregate. SC/ ST: 08 marks in each part and 33 marks in aggregate. OBC: 09 marks in each part and 37 marks in aggregate. Examination Centres: Ajmer, Alwar, Bikaner, Jaipur, Jodhpur, Kota, Udaipur. Applicants are advised to go through the official website www.doprajrecruitment.in. Candidate fulfilling all eligible criteria may send applications from 15-11-2017 to 14-12-2017. Last date to deposit application fee is 16-12-2017.